Inventory We are a resale marketplace, not a box office or venue. Ticket prices may exceed face value. This site is not owned by M&T Bank Stadium . 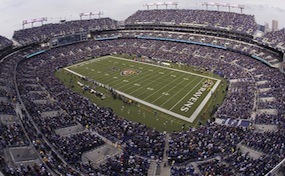 M&T Bank Stadium has been the home of the NFL's Baltimore Ravens since its opening in 1998. It is located in the Camden Yards section of Baltimore at 1101 Russell Street. The seating chart capacity for most National Football League games is 71,008. The stadium has also been host to a variety of other events including a Notre Dame vs. Navy game, Chelsea FC vs. AC Milan, and will soon host a concert for U2 on June 22 in 2011. M&TBank.StadiumBaltimore.com is not affiliated or associated with any official venue, website, or primary box office. We are an independently owned and operated company that concentrates primarily in the online resale of all events in the secondary ticket market. Prices on our sites may be above or below face value and have a tendency to change rapidly with demand. To order tickets to all M&T Bank Stadium events please call our operators at your convenience or follow the steps online through the checkout.